Versions for DS 4.0 and 4.5 both appear in the downloads. So you get the upgraded 1.2 versions for both DS4 and 4.5. Okay, very cool. Thank you! OK, I know I missed something somewhere. I just bought the upgrade here for the original Gen4 I bought at 'rosity. 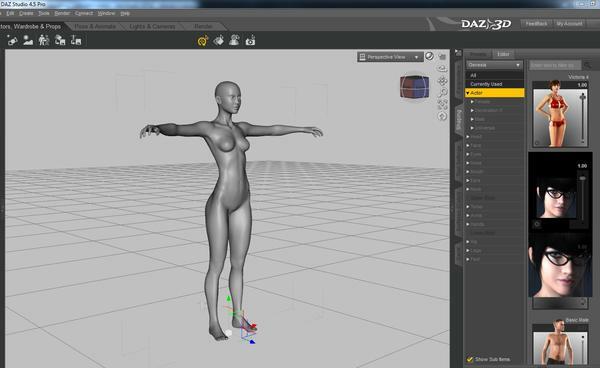 How do I find the right serial number to get it to work in DAZ 4.5? Read the included PDF for specifics. You need to go to your Renderosity account and get the order number for Gen4. I did. The order number is 9 digits long and the serial number field is 30. No joy there. Velvet Goblin: The actual download for GenX still includes the DS 4.0 version, but this is GenX 1.1. For the improved GenX 1.2, you need DS 4.5. Look for the PDF in the 'docs' folder where you installed Studio. It explains how to Validate your order number. I find GenX so useful that I am almost tempted to just re-buy the full version from here so I don't have to deal with the validate in the future. Helps if I actully look far enough down the list to see my serial number. I keep forgetting that the list defaults to 10 when I've got over 30 numbers to list. Now... it's active and ready, but >windows>tabs doesn't show the Gen choice. After validating my original 1.0 install of the GenX Upgrade fro Gen4, I was not asked to validate again for the 1.1 and now the 1.2 updates. After being validated once, it does not appear to need validating again. I just need it to work with 4.5. I still have about tirty figures that need to convert over to Genesis. This tool save me a lot of time in re-creating some figures and some of them were for paid work, so I don't mind going through anything I have to for the ability to use it. If you installed GenX and registered it successfully in the "About installed plugins" dialog (check there that registration was accepted), GenX should be listed in the main menu under Windows / Tabs when you start DS the next time. If it is not listed, this may be due to customization. Use Edit / Customize and look under "Panes" on the left side. This should have GenX listed, so you can add it to the Windows / Tabs menu (or elsewhere) manually by dragging it onto the right side in the Menus tab. And it works perfectly! I'm gonna spend a good part of the day converting the other 30 or so figures I've had sitting aorund in older runtimes and then start on the clothing. As I've said this is actually saving my a LOT of time and that means less stress - thank you! Does anyone know if this will work with v4/v4/etc morphs that stretch geometry beyond it's limits? I made a post a while back about needing a morph that could extend my Genesis-monster's mouth extremely wide and tall, but gave up because there was no morph for Genesis and did not want to try to make my own. 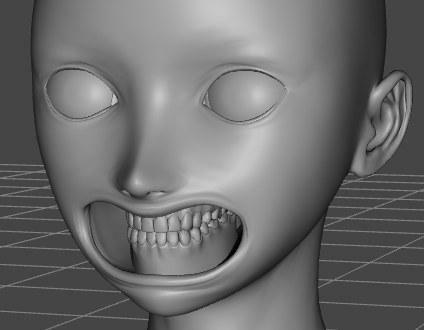 I have a morph for the V4/M4 line that allows to get the mouth extremely wide (with some minimal post work). Will this work with morphs like that? In general, GenX works with any morph. However, results may differ. Rather extreme morphs may transfer less well. The image shows the MouthFurious morph for Aiko 4 transferred to Genesis. Is this extreme enough? What 's changed on GenX? is this a bug or? What transfer mode (the drop-down list left of the "Select" button) are you using? Except for "Selected morphs", you should get a dialog box for parameters. The "Create single morph" mode from the tutorial works for me as it should and opens the parameters dialog. i just leave it to selected morphs, isn't that ok? and how do i delete GenX morphs back from the list? "Selected morphs" creates one morph in Genesis for each morph that is selected in GenX. "Create single morph" sums up all selected morphs into one morph and transfers this as a single morph for Genesis. You can manage (disable, delete, restore backups) transferred morphs from the "Morphs" tab of GenX. Have a look at the manual to learn about the features of GenX that are not explained in the video tutorial. thx, i deleted them in windows folder. under the morph tab, i can delete or enable the morphs. but it seems that i have to delete one by one, but i have more selected to delete. should this happen? can i not delete them all at once? why do we need to restart studio everytime to see the changes happen? You don't have to restart DS. After transferring morphs, you have to start a new scene to ensure DS rescans the morphs folder of Genesis for new morphs, but only if Genesis was loaded into the actual scene before. after drag them to the GenX tab, i can't find them under the body section. I was thinking something more like http://www.edutopia.org/images/graphics/cs_monster_mouth.jpg, but that is certainly much bigger than my Genesis currently can do, so it's a step in the right direction! I turned the V4 NGM morphs into ExP morphs after getting them, with dials in the Body as well as the chest, and I don't have the original files to check; but my recollection is that as supplied the NGM morphs were only in the chest, with dials only in the chest and no valueParm controller channels in the Body. So they won't be listed under the Body section of the GenX tab. fixme12, DavidGB: If the morphs are in the chest actor only, GenX should list the chest and show the morphs there. In general, GenX shows all morphs/parameters in the same actor as in the original figure. To keep things simple, GenX has options to show or hide dependent and/or hidden morphs, that are usually not used directly. Paradigm67: The Aiko morph was the most extreme morph that came to my mind for mouth morphs. More extreme morphs might work as well, because GenX essentially maps the deltas of the original morph to the points of the Genesis mesh. So, there's no principal limit about what morphs can be transferred, it's just always a bit random how well a particular morph transfers. Smoother morphs usually transfer better because they have less differences when mapping from one mesh to the other. why the V4morphs++ will dismesh the GND4 export with genX? Why V4_CTRL_JawFix is created automaticlly when you create a new V4 GenX morph? I'm getting off to a slow start with this. Got a couple of issues. 1. I've seen someone post a preview of the Aged morph for M4. So I know that it *will* transfer. I can drag the Aged morph into the field for transfers. But it comes in at zero value, so it won't transfer, since I gather that only morphs set at something other than zero value are transferable (I get an alert box that says there isn't anything to transfer, even when I've checked the boxes in the list). The column which shows the value is not a live text column, I cannot change the value in the column to something other than zero. How do you activate the morph so that it will transfer? I am assuming that I have to drag it in from somewhere else, like the parameters tab after applying it to a figure. Or is this when you choose some other option in the select drop-down? 2. This is related, but at a remove. I have a lot of character targets that I would like to transfer, but they do not apply automatically. You can't just click on them. I always have to point the program at a subfolder in the library/morphs folder, or some such thing, usually more than once, before the character will apply. Ergo, these cannot be drag-and-dropped into the transfer field, because the links to the actual morphs do not come in by dragging. I can apply them to the base figure that they are intended for, but how do I move them from an actual figure rather than the content list. I gather that this can be done, since how else would someone transfer in an older figure that they dialed from an earlier base figure? 3. As you may guess, I've got some dud transfers that show up in my list of GenX transfers, where the body transfered, but the head didn't, or transfers where the transfer was fine, but I somehow managed to direct the plugin to the wrong .png to identify it. How do you edit or delete your previous transfer files? I have a question about the DSF toolbox. In reading over the product I saw where one feature is to be able to create a dsf uv set from an obj file. Does this mean I can export say V3 as an obj with all the appropriate zones and then use the toolbox to create a uv set that can be used to allow genesis to accept v3 skins? I am already planning on purchasing genX + the 3rd generation bundle as soon as I have the funds available and I was curious about the toolbox as well.